Duracable Manufacturing distributes a wide range of location equipment, camera systems, and supplies. Using Location Equipment and Camera Systems can help you increase sales and profits by using the equipment during service calls. Using a camera system helps establish credibility with your customers by showing them the condition of their drain lines. 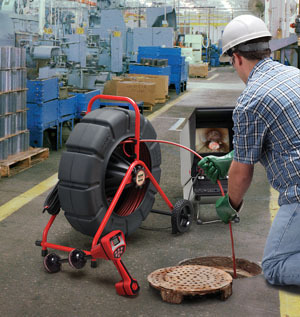 By allowing the customer to see the damage, or condition of the drain line, you will be able to sell additional services such as root cutting, excavation, or even drain line maintenance. We carry the latest RIDGID camera systems available. Call for more information on availablity and current pricing at 877-244-0740. Duracable is also a certified repair center for RIDGID cameras. We offer flat rate pricing on camera reel repairs such as camera retermination and camera head replacement. We know how important your cameras can be to your business so we work to return your camera to you as soon as possible. To arrange to send your camera in for repair, please contact us in advance for an authorization number. Once we receive your camera in for repair, we will diagnose and contact you with an estimate for the total repair service. If you choose to decline the repair service, we will only charge you a nominal diagnostic fee. Have a camera system that isn't RIDGID? We are sorry, we can only repair RIDGID camera units at this time. For more information or pricing on available camera inspection equipment, please contact a Customer Service Representative or Account Manager at 877-244-0740.